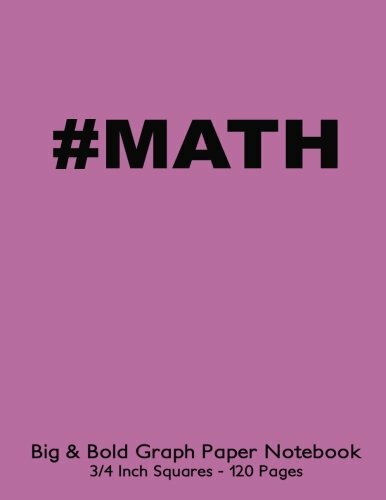 #MATH Big & Bold Low Vision Graph Paper Notebook 3/4 Inch Squares – 120 Pages: 8.5″x11″ #MATH Notebook Not Ebook with pink cover, Bold 5pt distinct. 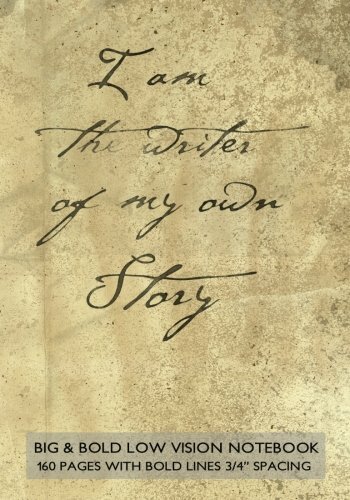 for math, handwriting, composition, notes. 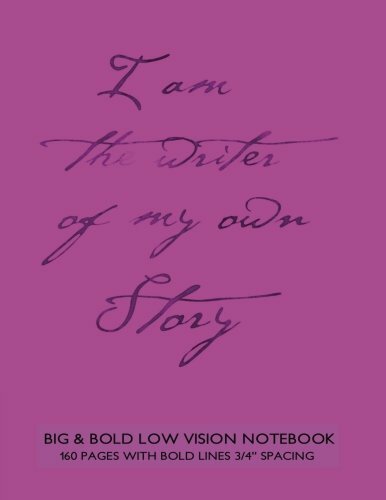 Big & Bold Low Vision Notebook 160 Pages with Bold Lines 3/4 Inch Spacing: 6″x9″ Notebook Not Ebook with purple cover, distinct, thick lines offering … impaired for handwriting, composition, notes. 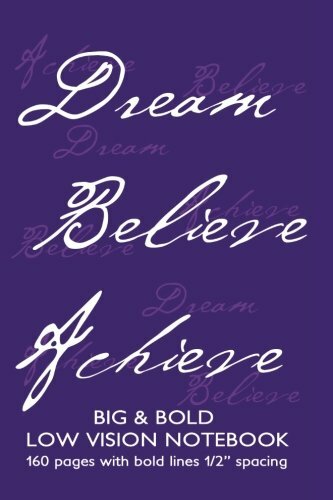 Big & Bold Low Vision Notebook 160 Pages with Bold Lines 3/4 Inch Spacing: 8.5”x11” Notebook Not Ebook with purple cover, distinct, thick lines … impaired for handwriting, composition, notes. Big & Bold Low Vision Notebook 160 Pages with Bold Lines 3/4 Inch Spacing: 8.5”x11” Notebook Not Ebook with olive green cover, distinct, thick lines … impaired for handwriting, composition, notes. Big & Bold Low Vision Notebook 160 Pages with Bold Lines 3/4 Inch Spacing: 8.5”x11” Notebook Not Ebook with pink cover, distinct, thick lines offering … impaired for handwriting, composition, notes. 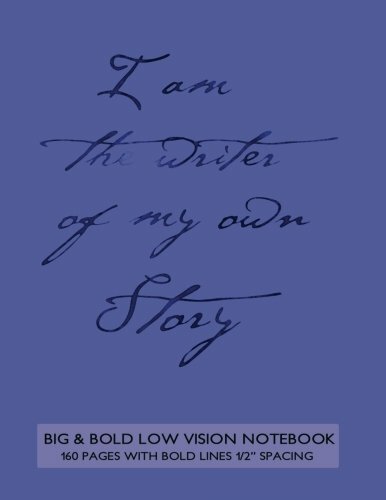 Big & Bold Low Vision Notebook 160 Pages with Bold Lines 3/4 Inch Spacing: 7”x10” Notebook Not Ebook with blue cover, distinct, thick lines offering … impaired for handwriting, composition, notes. Big & Bold Low Vision Notebook 160 Pages with Bold Lines 1/2 Inch Spacing: 6”x9” Notebook Not Ebook with purple cover, distinct, thick lines offering … impaired for handwriting, composition, notes. 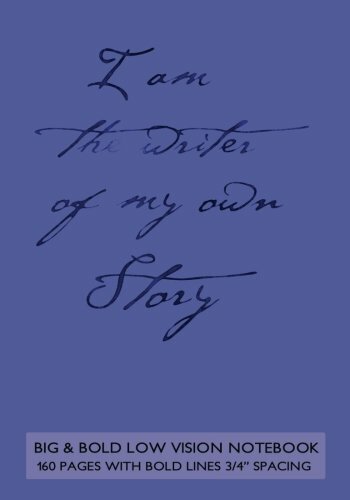 Big & Bold Low Vision Notebook 160 Pages with Bold Lines 1 Inch Spacing: Notebook Not Ebook with blue cover, distinct, thick lines offering high … impaired for handwriting, composition, notes. Big & Bold Low Vision Notebook 160 Pages with Bold Lines 1/2 Inch Spacing: 7”x10” Notebook Not Ebook with olive green cover, distinct, thick lines … impaired for handwriting, composition, notes. Big & Bold Low Vision Notebook 160 Pages with Bold Lines 1/2 Inch Spacing: 8.5”x11” Notebook Not Ebook with purple cover, distinct, thick lines … impaired for handwriting, composition, notes. Big & Bold Low Vision Notebook 160 Pages with Bold Lines 1/2 Inch Spacing: 8.5”x11” Notebook Not Ebook with blue cover, distinct, thick lines offering … impaired for handwriting, composition, notes. 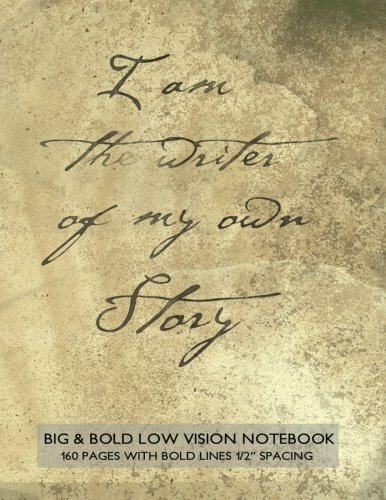 Big & Bold Low Vision Notebook 160 Pages with Bold Lines 1/2 Inch Spacing: 8.5”x11” Notebook Not Ebook with grunge parchment cover, distinct, thick … impaired for handwriting, composition, notes. 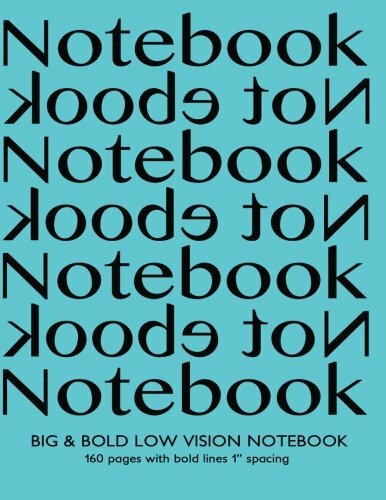 Big & Bold Low Vision Notebook 160 Pages with Bold Lines 1 Inch Spacing: Notebook Not Ebook with turquoise cover, distinct, thick lines offering high … impaired for handwriting, composition, notes. 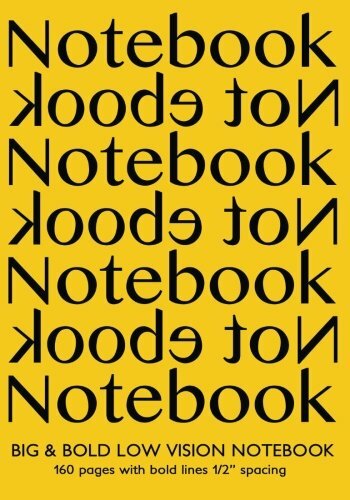 Big & Bold Low Vision Notebook 160 Pages with Bold Lines 1 Inch Spacing: Notebook Not Ebook with yellow cover, distinct, thick lines offering high … impaired for handwriting, composition, notes. 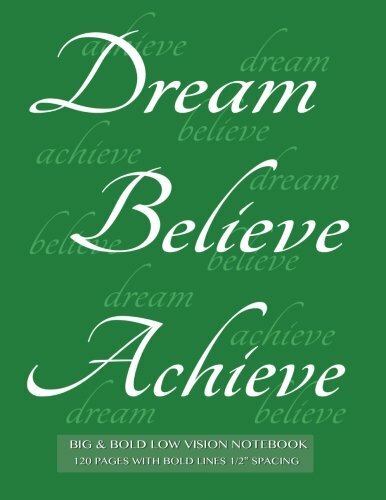 Big & Bold Low Vision Notebook 120 Pages with Bold Lines 1/2 Inch Spacing: Dream, Believe, Achieve lined notebook with inspirational green cover, distinct, thick lines offering high contrast. Big & Bold Low Vision Notebook 160 Pages with Bold Lines 3/4 Inch Spacing: 8.5”x11” Notebook Not Ebook with blue cover, distinct, thick lines offering … impaired for handwriting, composition, notes. 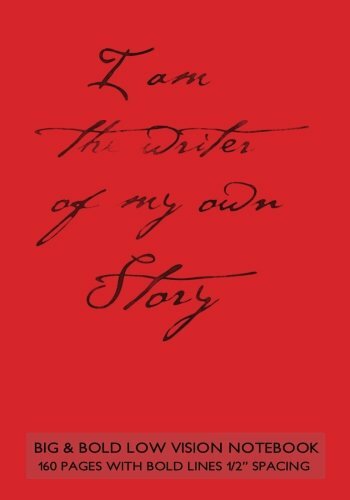 Big & Bold Low Vision Notebook 160 Pages with Bold Lines 1/2 Inch Spacing: Notebook Not Ebook with red cover, distinct, thick lines offering high … impaired for handwriting, composition, notes. 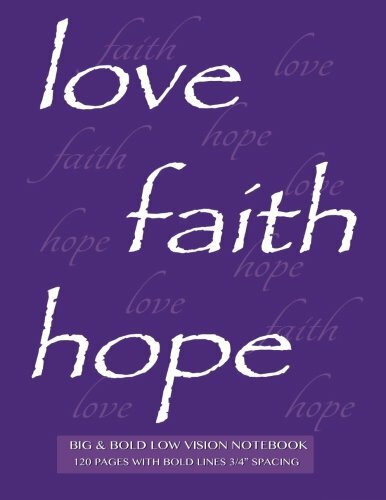 Big & Bold Low Vision Notebook 120 Pages with Bold Lines 3/4 Inch Spacing: Love, Hope, Faith lined notebook with inspirational purple cover, distinct, thick lines offering high contrast. Big & Bold Low Vision Notebook 160 Pages with Bold Lines 3/4 Inch Spacing: 7”x10” Notebook Not Ebook with grunge parchment cover, distinct, thick … impaired for handwriting, composition, notes. Big & Bold Low Vision Notebook 160 Pages with Bold Lines 1/2 Inch Spacing: Notebook Not Ebook with yellow cover, distinct, thick lines offering high … impaired for handwriting, composition, notes. Big & Bold Low Vision Notebook 160 Pages with Bold Lines 1/2 Inch Spacing: 7”x10” Notebook Not Ebook with red cover, distinct, thick lines offering … impaired for handwriting, composition, notes.